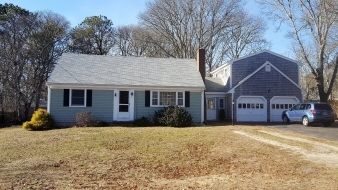 Conveniently located this spacious Cape features 4 bedrooms, 2 of which are on the first floor, 2 full bahts, hardwood floors, fireplace, Air Conditioning and 2 car garage. The 396 Bonus Room above the garage has a recently remodeled full bathroom, Situated on a nice lot with fenced yard this property offers a full basement with both interior and bulkhead access, 50 gallon hot water tank new in 2015, front roof new in 2018 and oil tank new in 2011. All information deemed reliable but not guaranteed. buyer/Buyer Agent to verify all information contained herein.